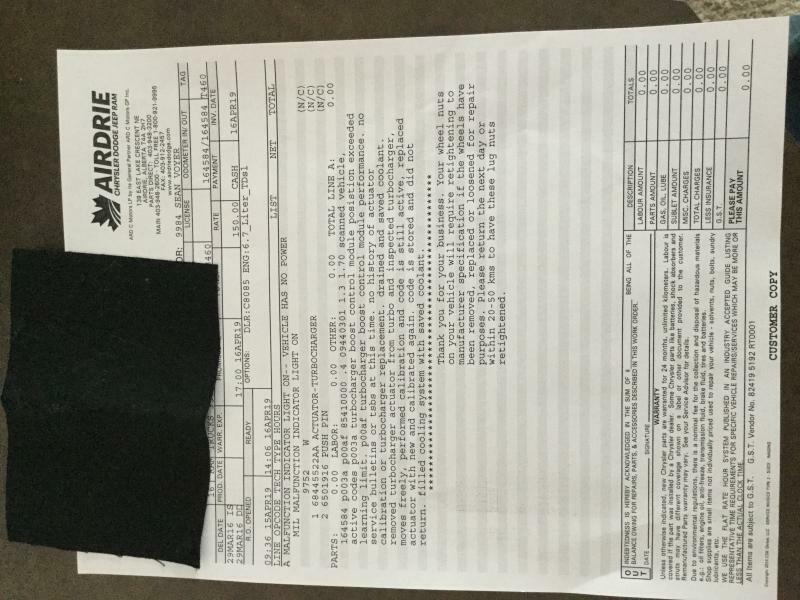 Truck is currently in the dealership service department getting several recall items taken care of. There was also a check engine light and it was diagnosed as a bad turbo actuator. Originally the dealership wanted $4,000 out the door. I have seen a few discussions here on this subject and thought that the turbo actuator was fully covered under the 100,000 mile powertrain warranty. They said they would run it through Chrysler and they came back with a "$500 deductible" as my total. I called Chrysler customer service and after about a 10 minute hold they came back with the same info. So, anyone out there that did get this fully covered under the powertrain warranty? Any advice from anyone else? Thanks! Just the actuator, not the turbo. So a $500 deductible for the actuator replacement ONLY. Service dept said if it was the turbo it would be covered. This contradicts statements I have seen on this forum about the actuator itself being covered under the powertrain warranty. It sounds like some kind of out of warranty deductible. I don’t have any kind of extended warranty or policy showing this deductible. I don’t know that $500 is the way to go for a part that is likely to fail again within 75,000 more miles. If you participate in the repair you will be given a 24 month unlimited mileage warranty on the parts they replace during this repair. All in all not a bad form of protection. The warranty will be honored at any FCA dealer nation wide. Kinda like buying a fraction of an extended warranty! Get a second opinion. No actuator should cost 4k. I would be willing to pay a $500 deductible for a new turbo and actuator which most dealers try to replace together. Had mine done last week, just the actuator and it was 3200 at the dealer. Had a 100 deductible from warranty. Ooooooooo that’s gotta hurt. I’da serious contemplated an aftermarket set up at that price. Just had mine done today, actuator only. Part cost was $34xx for the actuator. And with the $150/hr shop rate and taxes it would have been a $4000 day. Guess my extended warranty just paid for itself. I was only 4584kms over the Cummins Powertrain warranty. Good luck with the new government! Just the actuator was $3400??? Thats only $2500 USD but still you are getting screwed. I bought a reman turbo with a BRAND NEW actuator for $1700 USD from a local remanufacturer. It carries a 3 year, unlimited mileage warranty. You guys are getting it broke off in your a$$. Who's getting it broke off? You're the one that paid money, he didn't.